The College Avenue bridge over Fall Creek closed Monday for bridge deck and sidewalk replacements. Pair this road work with the Dig Indy and Red Line projects, and the commute can get a little messy. We took to the detour routes to see how the traffic is flowing. INDIANAPOLIS -- The College Avenue bridge over Fall Creek closed Monday for much-needed bridge deck and sidewalk replacements. 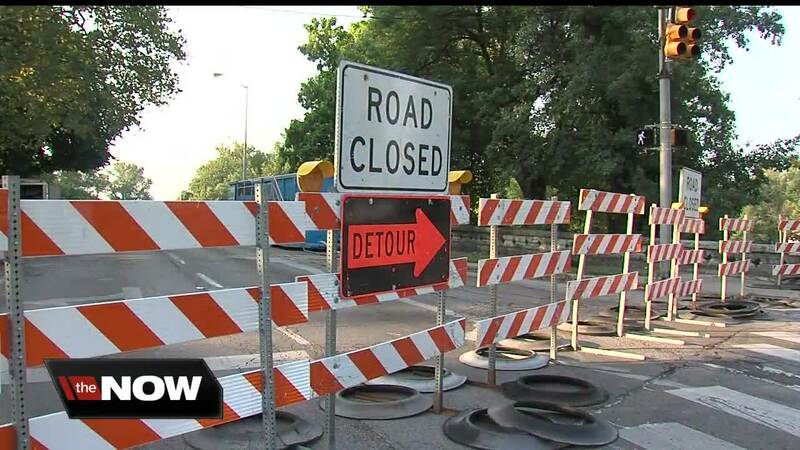 Pair this closure with other construction projects, such as the work being done on the Dig Indy and Red Line projects, and the commute can get a little messy, especially with all of the detours. "It's different every day, it's a challenge to get through," said Gary Schmitt, who makes his way downtown for work at Ivy Tech College. Wednesday marked the second morning commute since the closure of the College Avenue Bridge over Fall Creek, so to see how the alternate routes, such as Keystone Avenue, Capitol Avenue, and Fall Creek Parkway are doing (in terms of traffic flow), we went out for the commute. "It's a lot of traffic,” said one driver on Fall Creek Parkway, who wished to not state his name. Despite there being added congestion on the routes, the drivers we spoke with don’t seem to mind. “Usually I get to work like 20 minutes early. But, I leave early, so I'm always there on time. So, it's really not that bad. It's not a problem to me,” added the anonymous driver. The key is to watch the clock. "It gets kind of backed up," said Nathan Bonneoo , a Castleton resident who goes to school at Ivy Tech. "Sometimes I feel like if I don't leave right at 8, it's almost like you can't move at all. It gets a little ridiculous." And remember that patience is a virtue. "It's taken an extra 20 minutes, but it's not the end of the world or anything,” Bonneoo said. We asked DPW if any teams were monitoring traffic flow with all of the road work and changes in traffic patterns because of the construction. DPW said the engineering traffic team is monitoring traffic and may add more pavement markings, as necessary, to help drivers feel more comfortable with pattern changes. The College Avenue bridge over Fall Creek is expected to open back up on Nov. 17th.